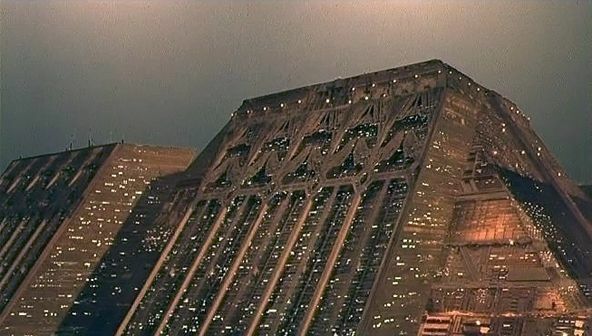 There is a moment in the first Blade Runner film that is fleeting yet unforgettable, it is when the replicant designer takes one of his previous creations back to his home. On entering the derelict building, the action suddenly cuts to the advertising platform slowly drifting by above them. In amongst its wandering arc lights is the huge white face of a geisha that looks down smiles, beckons and is gone again. We never have time to identify the snack the phantom visitor wants us to consume. We can only accept that the polygloting people of Los Angeles in the year 2019, would be able to understand the enticing spectre. But this is unlikely, as a geisha’s white makeup is worn only when performing a formal dance. That distinction has been preserved in the modern publicity (posters, advertising) of contemporary Japan. The phantom geisha is in fact a testament to the success of the studio TV advertisement of the mid 1960s where Ridley Scott learned his trade. The concept of the obliging and enticing, white faced geisha, is as much a western invention as the 'ploughman's lunch' in an ad by Scott. Scott's geisha and the lunch, represent freshness, quality but also distance – which can only be closed if you continue the dream of the product by purchasing it. Once you have done that, the commodity may or may not help you to escape reality. But even if it doesn’t its invitation trades on the virtue of being up-to-date—the latest experience. Both films and especially the most recent one, want to show the expanding scope of technology. This was prompted by the sequence were the detective in the 1982 film scans (enhances) an image in 3D. The scans and holograms in the new film are advanced enough to take on a life of their own. The female domestic hologram of 2049 has a subservient tone and shows undying loyalty and I can think of one chief executive who would prefer it to any human. That is also what both films idea of future life and technology is based on—that whatever else happens, future technology will be intriguing and powerful—and deadly. Dystopias like Blade Runner can be useful in this respect in demonstrating how an existing threat to future humanity can develop. For the inhabitants of London in 1936 the Italian and Japanese war machines were real enough, but their effects still appeared distant. But after seeing the film Things To Come (1936), which depicted the first mass aerial bombardment of London the prophecy became more potent particularly after the bombing of Guernica in 1937. That said it us useful to keep two points in mind. One is the vision of modern urban capitalism as a hell is as old as capitalism itself. Secondly, there are two common artistic responses that have characterized its history: (i) the optimism of opposition and revolt and (ii) pessimistic resignation to, or acceptance of capitalism as a fate that determines the death of humanity but not of the ruling class. The first represents the radical minority, the second the conservative status quo. K (Ryan Gosling) is the new 2049 detective with the same job of eliminating rogue replicants, but just as his domestic female hologram’s subservience is artificial, doubts begin to accumulate that K's brutality and indifference may also be replicant in origin. This at least can give the director and the writers an excuse for the violent excesses of both films which can be excused on the basis that those who perform it are not human—they were just “following the orders” of their programming. After the original film was released in 1982 feminist film critics made the observation that the pursuit and slaying of the replicant snake artiste, was a part of the films flawed violent male fantasy world as was the “correcting” of the woman who plays the femme fatal - Rachael, who refuses to be seduced and tries to leave Deckart's apartment – something that can be cured by Deckart (Harrison Ford) shoving her around and commanding that she kiss him. Wanting to leave indicated genuine (finely acted) independence but in this world her resistance was futile. Conscious of the negative reputation of the original film being seen as a promoter of misogyny, the new film tries to level things up by having the chief of police be a tuff-non-replicant female clad in leather, who later has a violent encounter with the Tyrell corporation’s female head of security. So now we have the luxury of two new powerful women who can be both undead and deadly. At this point it is important to look at the violence in the way that the majority of film directors do, that is as something to be repeated a number times on set to get right, so as to convince an audience that it’s 'real'. Sometimes, an actor and the director can go too far in the quest for realism and end up actually hurting someone. This looks as what appears to have happened when detective K issues a corrective punch to one of the few black members of the cast. After being uncooperative he is then seen grovelling in fear. And I can think of a number of neo-nazi's who would prefer this was part of an everyday reality. Conversely, of the women who have seen the Tyrel Corporations cyborg zen master (Jared Leto) preside over the birth and brutal execution of a new female replicant, I wouldn’t be surprised if they thought paying to see this film had been a waste of time and money. On the surface it is not difficult to see why both films have divided audiences, which has affected the ability of this particular dystopian vision to pay for itself. The “visuals”, as Roger Ebert called them are good, but the actual story and characters don't seem to work. Why? The more you consider it, the more it ceases to be ironic that this ancient mega-structure is still the potent symbol of ruling class power and the world of the twenty first century—each world cannot have, or possess, that most modern and revolutionary of inventions: government by representative democracy. The standardized characters from past popular fiction—the detective, the chief of police, the femme fatale, the person as automated product, the company boss and head of product security—are models with a half life that began to mutate and decline almost two centuries ago. Having resigned itself to the task of trying to become the human half of the replicant, the humanoid character thirty years on can only be scripted as a progeny that lives its virtual life under a display case in a social vacuum. This is a stunning conclusion but it is a conclusion none-the-less that marks the pinnacle and the end of a bourgeois world view of the masses as a collection of ominous individuals, first imagined by Edgar Allen Poe in his story The Man of the Crowd in 1840. This generation of young workers are not fools or narcissists or willing automata, they know when they are being exploited and try their best to act accordingly. Their problem is that they lack the effective means and organization to fight back. When they do organize the effects have been impressive as the recent British election has shown. This is the social context of society and today's workers that are making history and the future.